Well, I gotta bug, a bug to write the only way I really know how. So I’m opening up a new blog, more down to earth and I truly don’t know how it’ll go or anything but its been on my heart for a while. This blog was opened about a year ago and I have enjoyed it, but I feel led to write more of a farming blog, one that’s easy to put pictures on that won’t slow down people’s computers. Blogger offers that and that’s why this final move. And I mean final. This is it, after this, no more. Its under construction and it’ll take me some time to get this farmer/preacher site up and running smoothly with links and all, but it will come a little almost every day. I apologize to those that have linked here for any inconvenience changing links, but that’s how she bounces! The spring that sprung here the last couple of weeks is hanging on with very nice weather for this time of year in these parts. Got up into the fifties again today, mostly sunny with a nice breeze to aid drying of the mud. The writing above is from the book, “Autobiography of Peter Cartwright”, perhaps one of my favorite books of all time. Written over a hundred and fifty years ago it comes alive for me today. In the late evenings after Bible reading I like to page through and reread parts of it. If anything inspires me, this book does. Now being like most folks, American folks anyhow, I always like the action packed parts, the huge camp meetings, the huge conversions, the fights with the drunken rowdies and all. But in reality as I read through the book I sense that the vast majority of the ministry was much less actioned packed than that. The paragraph above shows of sorts that life was not always comfortable, in fact rarely for those men that stormed hell’s gates in the great Mississippi Valley of this land. Sometimes hell’s gates are not in the place where the action is, but in the day to day mundane places of life. Meeting folks one on one as they traveled, stopping at homes and cabins every day when they could be found. One on one ministry with hurting folk. I do believe this was the reason for the huge success of the campmeetings in those days, the year’s worth of one on one ministry anywhere and everywhere. What would it take nowadays for someone to spread the Gospel like these men did? I highly doubt that the conditions would be as bad as those preachers went through as far as the elements were concerned, but human nature hasn’t changed a lick from then until now. We have that sinful nature with us in humanity now the same as they did back then. About the only difference is the fact we have a lot more opportunity to sin easily with the abundance of wealth that we have in this country nowadays. We have a false sense of security in this society that “will” get us if we don’t hand our lives over to God. It is impossible to have one foot in the heavenly Kingdom and another in the world system. Want to dance with the world, well, that’s where a person will end up, and the world will perish! One of the rarest things about the history of circuit riders is to read a sermon from them, at least a full sermon. Why? Because they never wrote sermons or read them! And its difficult to come across anything remotely close to one. But I do know that they took Bible verses, what I call power verses, and could preach the bark off an oak tree, for hours! The listeners would hit the ground, the power of God coming across so strong that folks would literally lose it. Many times it was recorded that there was a noise like a loud rushing wind when the Holy Ghost swept in. And this was very common. Why I wonder, why then and not now? The answer is simple. They preached the Word. They preached it without fear of man. Nowadays they would be considered by the vast majority of the church as lunatics. They stepped on toes, allot of them. They’d point sinners out in the crowd, they’d tell it straight, never mushing it up. They didn’t worry about lawyers suing them, they had to watch out for bullets, a mob’s hanging rope, rowdies beating them to a pulp. But they had ministries that were John the Baptist ministries, fear no man, just belt out the truth. Lord, how I want the anointing they had, I covet it! To fear no man, to spread the Word to any and all who will listen. To preach to one or to a thousand, makes no difference. To lay it on the line and never back up because someone was offended. Preaching against sin will make any preacher unpopular, let me tell you. Folks want a feel good about themselves religion where by they can feel good coming out of church and sin like hell the rest of the time, falsely believing that they have it made and can live like the world and do a one hour duty every week or so and they have the keys to heaven. But nowhere does it say that in the Bible, no where. It says, do not sin. Simple. And if you do, repent, bring it to God, get it covered by the Blood and move on. There’s hurting people out there, hurting allot. Town or country, it makes no difference. Society is in a bankrupt tailspin. The false sense of security that decades of material prosperity instilled in most folks is crumbling. People want answers. The government wants to provide every answer but in reality just keeps digging a deeper hole that will be very difficult, if not impossible to get out of. There is only one answer and that is Jesus Christ. No matter who it offends, no matter what folks think, He is the answer, the only answer. He is the only way to eternal life. No roads lead to eternal life except His road. If it offends folks, good. They need offending! They need truth! The flooding is pretty well done around here. The creek is going down rapidly and today was the first time this year I made it to the back forty to take a look around and see if it was still there. Yep, its still there! I drove around on the Honda four wheeler and just generally enjoyed myself for a while, looking at fences, looking for dead trees to cut up for some spring firewood and for next winter’s supply. The only wildlife I seen out there was an owl I spooked, oh, and a bunch of geese. There’s so many resident geese here in the river meadows that I almost forgot about them. Its getting so they don’t even count as wildlife, more like our herd! I reckon they’ll be laying eggs soon, those are the earliest reproducing birds around these parts with the young’uns swimming around before I even get to planting corn. They say the big four lane bridge over the Mississippi at our county seat is closed. Anyway that’s what I heard last evening at church. Ice jams on the big river have those who know nervous about the integrity of that huge bridge. This is Minnesota and huge bridges falling into the Mississippi are not unheard of so all the highway traffic is rerouted right through town, just like years ago. It doesn’t affect us one bit out here, just some local news is all. Church went pretty well last evening, was out in Children’s Church doing my thing. Had a good sleep despite all the tar like coffee I downed last evening and today cleaned another barn, deep stuff, a whole winter’s worth of manure. I’m still not able to haul it into the fields so I just stockpile it but if this weather continues that manure spreader could be making tracks in the fields soon. I promised myself that I’d get stuff together for this Sunday’s church service, a whole one page of notes, extra large print, on the subject I want to talk about come Sunday morning. Now I do have a real bad habit of never getting hardly anything together for a service till its just an hour or so before we take off to church. I will try extra hard tonight to do something, trouble is I’m more of a pressure worker, get er done just before the deadline. I figure the talk will be on the verse I’ve written about here a few times recently, Hebrews 13:8, “Jesus Christ, the same yesterday, and today and forever.” Been thinking in the mornings about it and now that I’ve been hauling manure in the afternoons that gives me even more time to think about it. I figure a person could preach a lifetime with that verse being the main verse. I think I could do nothing on this blog except start every post with that verse and never run out of things to say.The same today. I guess His name ain’t “I WAS”, He told Moses “I AM”. Or He didn’t say “I’m Gonna Be”, no, He said “I AM”! Now day after day dwelling on this is making a huge impact on my journey of faith. Its much easier to have faith in a now God then a once was God. A God that knows our every need, even if we don’t. An amazing thing came to me, I was thinking about our youth at church. They don’t have that old religious dry rot that us older folks have.Most, if not all of the adults in church came from religion. But the youth didn’t. I was really dwelling on this the last few days. I’ve seen it time and time again,something that would clobber one of us adults right down to the ground basically glances off the youth. From disease to injuries. They can’t quite seem to take hold. Injuries that should have taken weeks, even months to heal, healed in a day. Recovery from emergency situations a matter of hours, not days or weeks. And I will stress this is not because they are young and healthy. This is because they aren’t spoiled, ain’t got that rot of religion in them to keep them down. Oh Lord, thinking about this the last few days has really got me thinking. Thinking how things run on simple faith. Now,I know some folks that won’t believe nothing in the Bible if they can’t make human sense out of it. I must say that when this happens there is nothing but a life of total defeat heading their way. Why? Because of simple unbelief. What I’m about to say might actually shock some but I’ll say it anyhow. A person doesn’t have to figure out scripture. No they don’t! Because if a person is trying to figure it out from our tiny human level it’ll never get done, rest assured. Folks that supposedly know all about the scriptures after years and years of schooling aren’t hardly any closer than when they started. Amazing huh? This is one reason I don’t have a study Bible. Because I don’t want someone’s opinion about every scripture in the Book. There’s a good chance that they are way off on some of them and I figure why go down with em. I go by what that preacher of old, Smith Wigglesworth said, “just believe it”. That’s it, just believe! Looking back at anyone that ever had a hand in the huge moves of God there is a very definite pattern. Some were educated, some weren’t. But the similar thing between them all was that they just believed. Our God is a faith God and our God will move mountains for those that just believe! Smith Wigglesworth would read nothing else other than the Bible. I do believe it was just a plain Bible too. Just read it every chance a person gets, read it till it becomes a part of your very life. More than a part, how about life itself?! Just believe it. Not trying to figure it out, because when a person believes in faith the divine revelation comes. Revelation that studying with the mind could never accomplish. That’s what I see in the youth at church. That’s what I see more and more in my own life. Just believe it, don’t try and figure something out that no one on earth can figure out anyhow without God implanting the revelation in them through the Word. Just thinking tonight, just dwelling. Just looking at the people that changed the world for Christ. They had simple belief. A week ago if anyone would have told me that most of the snow would be gone I wouldn’t have believed them in the slightest. But its almost history around here. Just some deep banks left and in the yard the snow piles are melting down that the Bobcat piled up over the long winter. I was even able to roll out a big round bale today on the gravel knob in the calving pasture and as of this evening I see the entire cowherd is resting over there on that gravel nob because its about the only dry and firm place on the farm as of this moment. Its about an acre in size right now and it will expand rapidly as things firm up. Some spots will take weeks to firm up, but as long as a person gains some ground for the cattle to eat and rest on things go pretty good. Heard my first killdeer last evening and this evening while cutting some slab wood up for the outdoor boiler I heard my first Sandhill cranes about a mile away. Took me by surprise hearing them, hearing them above the robins tweeting like robins do in the back yard, and above the noise of the geese down at the flooded creek a couple hundred yards to our west. Things are changing here fast! Well, today I had the rarest of days, I had three hours off this afternoon, or should I say I literally forced myself to have some time off, first time in a long, long time and a good friend of mine from church took me to the city thirty five miles southeast of here and we went shopping for a rifle. The last twenty years every time I went to a sporting goods store or even a super store that sells rifles ol’ Tom is always known to be checking out the lever action 30-30s. Never could bring myself to buy one even though they are fairly affordable. Twenty years of looking every time, but today I found one that I had to take home. A used Marlin 30-30, lever action. Simple rifle but a durn good one to have around this place. Have it leaning up here in the office as I write. In fact I do believe I’ll use it more than all my rifles combined and only that old double barrel 12 gage seems to get more use around here. Another thing we were doing today was looking around in this huge sporting goods store, (its always funny how a country boy can feel at home in a place like that), we were looking at targets, clay pigeons and other things for some things we are planning come the warm season. A few days ago we started talking about this , how some summer get togethers for the guys around here would be a great thing to do this summer, and in this neck of the woods that usually means guns. Shotgun, rifle, pistol, and black powder. This might cause some city slickers to go into shock, but things are different here, and much better if you ask me. Already as the little bit of news goes out I have heard that some folks who really don’t trust churches would like to come to this, full knowing this is a Christian thing. Well, if stiff and dry church won’t get em, do something that will, and have a good time doing it as well. Fathers, single guys, youth, whoever are welcome! So this is in the works and I can’t see it being stopped, its to much in the men’s blood around here. Oh Lord, things are happening fast around here! The fast melt that I never expected, church stuff is picking up the pace again with the resuming of preaching for yours truly starting this next weekend after more than a month off of my own asking. Plus preach a little Sunday and immediately when its over take over the Children’s Church as a Sunday fill in teacher. So this coming Sunday should go by like a whirl! No big deal! And being that it’ll be double duty I figure I might as well do the same message in both churches, Hebrews 13:8. “Jesus Christ, the same yesterday, and today and forever!” Been teaching that for over a month in Children’s Church and I see no sign of letting up with it. A rock solid base for the kids, the base that Jesus is not just a yesterday God, nor just a future God, but that He’s our right now God and He does what He did back then, and that nothing has changed one single bit! Amen! That’s the rock solid thing a feller don’t even need notes for in either church! I’ve written about it several times here because its so durn important in the life of all Christians. And I believe that without this simple fact that this verse presents a Christian’s life will not have the victory that God intends for His children to have. Yep, a good outlook when spring comes knocking at the door around here.There was plenty of cabin fever around these parts this winter, the long winter that never had much change to it. But people are waking up, there’s smiles on people’s faces everywhere a person goes. Finally its breaking! Minnesota nice has become much nicer this past week! But there’s work to do around here both on the farm and in the field that Jesus has commanded us to work for Him. Wet is the word around these parts today again. Even had thunder and lightning, the first time this year and it kinda caught me by surprise. Had strong rains at times, even some hail a few different times. What a mish mash of weather in March. At least it didn’t come down as snow, so the melting process doesn’t have to kick in gear. Its already heading down the creek for the Gulf of Mexico. Everything around here is mud and slop. There’s a lot of winter to get rid of and it ain’t happening over night I tell you. Good thing I don’t calve this time of the year, that would be the ultimate disaster. Been reading in the evenings and for once they ain’t faith based books although they seem to be building my faith anyhow. Western novels, written by my favorite author Elmer Kelton from down Texas way. I hear Elmer passed away last summer but his novels are for me the best I have ever read. Have read them for years and years and have many hear in the house that I either purchased or had given to me. One thing I love about the two different novels that I’m reading is how he does mix real life into them. How he has a preacher or two in them and they usually are some pretty good folks. Some tough folks too! But enough of that now that folks know what I read in my spare time. I was talking a moment in a conversation at church last evening, yup I was able to be in the church for once and it sure was a welcome relief. A person needs that once in a while cause its rough just giving and not receiving. We were talking about the nature of God. Nowadays there’s a lot talked and written about the love side of God and sometimes its at the expense of not mentioning the truth side. A feller leans to heavily in either one and one thing is for sure, they will get out of balance and head for a ditch. Being to far in either side can cause problems, either liberalism or on the other side, legalism. There’s plenty of either side on the internet also. Extreme liberalism where God loves you and it finally ends up that a person can just about live any way they want and still figure they have it made eternally, to oppressive legalism that believes that our own works are what justifies us. Many parts of both sides have truth behind them, but are never the less out of balance and could be stuck deep in the ditch. Ditches that are about like the ones we have around here now, impossible to get out of on your own power. The Bible is perfectly balanced and I know when I read it I’m harsh about judging myself. The easiest trap to fall into is to read the Bible in order to justify my own opinions,my own beliefs. That always ends up becoming a disaster. The Bible is God’s Word to us, and God don’t change no matter what the high and mighty say. We had better change! He is a Holy God, a perfect God, we ain’t. Tired tonight, but I’ll do a short post anyhow. God is love and truth. His love is limitless, His justice perfect. We have the choice, to accept, or to reject. There ain’t anyone going to hell against their will. Don’t believe me, read the first chapter of Romans. I’ve taught about the quite extensively the last couple of months on Wednesday evenings. That’s usually a shocker for some, some want to argue it, but I stand on the Word of God and just ignore anything said to the contrary. God is perfect, we ain’t. Simple! God has put in every persons heart an awareness of Him. He sent His Son to this world to save a dying humanity. The offer for eternal life is freely given and one can freely accept. This has been burning into me all day long. Busy day here, gloomy, muddy, slow melting, light rain falling from time to time. The verse above has been in a post or two in the past, can’t rightly remember how many times or where I put it but this is one of those power verses in my humble opinion. Preaching the cross, and I might add, the Blood! This is as foundational as it gets. Without the cross, without the Blood, well, there’d be nothing, absolutely nothing. And in this day and age I know its not that popular to preach about these to things, heck I even heard a bigshot preacher talking against them a while ago. Saying we should be concentrating on the benefits of our salvation. Hello! There are no benefits without the cross, without the Blood! This was on my mind and in my heart heavily today. Think, just think what this verse says. This is just Tom’s figuring here. Nothing borrowed from Bible school, nothing borrowed from some big time preacher. Just look at the verse! Look at the Living Word! It says that preaching the cross is foolishness to those who are perishing. I tell you, that says a bundle! Think what this means, think what God is saying in these verses. When we water down the Gospel, when we make it seeker friendly, when we don’t preach the cross, preach the Blood, in order that we won’t “offend” someone because it might seem foolish to them. Because it might make them uncomfortable this verse says we will perish. Not in those words but that’s the meaning. Either the preaching of the cross is the power of God, the center of the Gospel, or else we are on the perishing side. Egad! The cross, the Blood, the very center of belief! Without it a person perishes. Without it there’s no salvation. To believe that Jesus bore our sins, to believe that He suffered and died, taking our place, a place we deserve. A gift. Nothing done through us, nothing. Jesus did it all. This is the Gospel! This is the salvation that no church can provide. This is the salvation that no preacher or priest can provide. Salvation is not a thing, salvation is a person and His name is Jesus. Our being set free was bought at an incredible price! But we must believe. We must believe that Jesus did go to the cross for us, that He shed His Blood for us. That there was nothing in this world that we could do to be right with God in our own power. Religion won’t get you there, good works won’t, only Jesus. Foolish, I know it sounds foolish. Foolish to the world, foolish to religion, foolish! But it is the Gospel! 27But God hath chosen the foolish things of the world to confound the wise; and God hath chosen the weak things of the world to confound the things which are mighty. No matter what a person believes, no matter what denomination they go to, this is bedrock. This is the only Way. This is the message that is preached in the byways and out of the way places, the places that society shuns. This is the message that gets preachers kicked out of a surprising number of churches nowadays. It makes folks uncomfortable. Its much easier to hear nice mushy messages, non convicting messages, those that don’t show what people really are. Those that don’t show people that they are perishing in their own sins. Its much more fun to go to church and hear messages that promise you that God wants you rich! That you can have all the stuff and live like the world and God loves you and just thinks every thing’s OK. But it doesn’t work that way, in fact its much simpler than what religion and a modern luke warm church preach. Just believe. My limited experience has shown me that the down and out only want truth, they only want an answer. They don’t want gimmicks, and neither do I. I want God and I know that I know that there is nothing ol’ Tom can do to please God using my own power, nothing. I will fail no matter what. But Jesus solved that problem. He saved me from myself . He saved me from this world that is perishing. A gift, not cheap, an incredible gift. Sometimes I get a little down. It happens and I ain’t proud of it. I gotta get to the Cross more! I gotta kneel down at the foot of that old Blood stained Cross and worship Him. The old timers knew this, but its been getting diluted over the years until there’s powerless religion with no real hope in this life or after. Allot of times churches are yammering that they want to see God move, or someday God will move in their church. Wanna know something? Why not now? Preach the Blood, preach the Cross and I promise that God will move in the church. Folks want the Holy Spirit to come with power, but it seldom happens. Preach the Blood and the Cross and buckle up! Cause things are going to move! Why do I say this? Just read the second half of the verse on top of this post. Tom might tell a tale once in a while but God ain’t a liar! Its starting to get muddy around these parts and taking advantage of the situation I was able to clean the what was once hard pack, a combination of snow and manure, off of the corral in front of the calving barn where I have butcher steers wintering as of late. That corral pen was about the first to let loose and I know it wouldn’t have worked in the other corrals just yet. So if the weather isn’t to rainy out tomorrow I’ll try and stab into another corral and see what happens. I still can’t haul manure to the fields, the snow is a tad bit to deep for the tractor and manure spreader yet so I’m piling the stuff across the gravel road from the corrals. The ground over there sets up quick when the snow is gone so that’s a good place. The other evening, Saturday, my wife and I decided to head to the county seat and revisit the Mexican restaurant that we first visited a few weeks ago. Now I know a little more what’s going on there so I ain’t as ignorant as the first time. Well, we sat down and I ordered my usual black coffee and we needed a few more minutes to figure out what we would like to order. Just about that time another couple came in that we knew, Mexicans, and after saying hi we asked em to sit on down with us being we didn’t even order yet, that way I knew we wouldn’t be out of sinc with each other eating and all that stuff. They did set on down and we had us a great time. Now my Spanish is barely survival Spanish but the amazing thing is I can almost follow most conversations in Spanish. But we talked English too.By the way, I had me a burrito and tamale meal, rice and beans included. I do recommend their tamales! When the food arrived, which is usually pretty quick in a Mexican restaurant, we took off our hats and I said grace, (in English, no sense screwing up a prayer I figure), and we got down to eating and joshing. 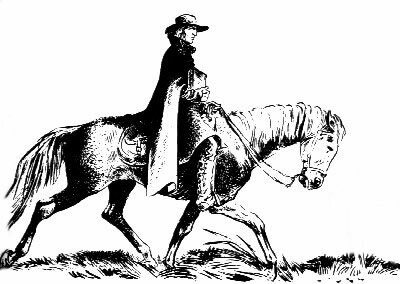 Cattle, horses and faith, the three subjects that are easy to talk about! I tell you, I got excited taking those subjects with them folks! Years ago I know I wrote somewhere on the old Northern Farmer blog about working and visiting with the local Mexicans and how I love those folks. It wained over the last few years somewhat,mostly because of the direction church stuff has been taking us, but I sure do want to get back to that. Besides when you visit them folks the feed for me is about the best it can get, plus they have a good laugh when this old gringo is in a dead sweat from eating some of their more potent food. Get you coming and get you going is the saying! The one thing I learned years ago was that I have no barriers with those folks. It hurts me allot when I hear folks, even church folks, think that they are a lesser person than the regular white folk around here. My experience with the Mexican folks is that there’s allot higher percentage of them that I would trust than what’s considered the normal folks around here. Now the last couple of years there’s been several churches in the area that want to reach the Mexicans around here and there has been very little success any way you look at it. And I can peg the problem right to a tee, of course anyone in the world can disagree with me but who cares. The problem the way I see it is simply that the churches in this area have not even the slightest idea what they are doing. There! Nuff said about that eh! You take a displaced rural people and move em up into this area and try and make them comfortable with a suburban style church setting and about the only thing that’ll happen is a few of their women will come with their kids, sometimes dragging a reluctant husband with that has only one thing on his mind, to get out of there. Total discomfort if I ever seen it. Those Mexicans that I know are no different than me, they want the real thing, not the suburban style of religion that’s common across this land. Talking the the restaurant showed me, it showed me big how folks can connect. No different than with so many country folk around here that will not go to church for anything. They want something real! They want God, even if it don’t look like it, they want the real thing. Talking horses, cattle and faith the other night blew this wide open for me! During the conversation I gave the man a Cowboy Bible that I always carry around in the coat pocket just looking for a new home, (the pocket has since been reloaded). I could tell that this was something special when he received it. A Bible that reflected their culture. He even said that they have cowboying in their blood, kinda like me, and loved this how the Bible was made for this cowboy culture. Yep, talk to people at their own level, not trying to bring them down into the suburban church culture. No need for getting em luke warm, better to get em hot! Better to bring Jesus to them, not trying to make them into something they ain’t. Same as me, you want to make me sick, just make me churchy, that’ll do it ……fast! How easy it is to talk Jesus when we don’t drag religion into the equation! This country styleministry ain’tso bad, in fact I don’t think I could ever bring myself to do the regular church programs and all that stuff. I like it real! The days continue around here with nice weather continuing day after day for quite a spell! Still have a deep snow pack that’s slow in shrinking but the plowed out parts are getting larger every day. The cattle are still enjoying it all, got em kicked out of the big loafing barns and out in the seven acre calving lot so they can bed down in the clean snow. My days are basically non eventful, just do the normal work and try to keep busy the rest of the day. It sure is nice not having those thick coveralls on all day. I feel so much lighter! Went to church last evening and am recovering from that. I do believe that the time is drawing near to pull out of that Children’s Church job, the job I am in my fifth year doing most Wednesday evenings. The grace is lifting as they say and its time to move on one of these days. Maybe before spring field work! I loved it for years but I know that when the grace lifts then I’m doing it on my own energy and that sometimes don’t work out all that hot! This morning while working I took a slight break and just dug my pocket cowboy Bible out of the coat pocket and was just flipping pages and this is where I ended up, in Romans 10. I put it on the post exactly the way it reads in those pocket Bibles which is NIV. In this change of seasons that I’m going through I love to go back to the foundational verses that just ground that faith in me. Those simple verses that I always love to go back to all the time to remind myself of what is really going on in this walk. That knowing that anyone who trusts in Him will never be put to shame! Yep, working all day knowing that the Lord God of the universe has adopted me as His son is quite the thought and I ain’t letting go of it anytime soon, well, how bout never! Daily chores take on a whole new meaning when a fella know that he knows that he will never be put to shame by the One that is above all. Quite a thought really! And what did a simple cattle raising person have to do to get into this position? Simply believe! Simply believe that Jesus is who the Bible says He is! I was teaching that last evening to the young folk and I think they got it down pat, that no works will get you to heaven. The Bible surely says that even though religion sure can come up with enough work to drive heaven out of anyone. Simply believe. Jesus got the boot from the churches in His day, the synagogues, and He just hung around the regular folks who would listen. Ah, the simplicity of the Gospels! Hope for the hopeless, the ones the church ignores. The religious bigshots of the day were concerned about how a person looks, how they acted, how they obeyed the man made rules. But Jesus just laid it out the way it truly is. Those bigshots didn’t like Him a whole lot, disturbed their station in life. Guess that’s why I love the church we go to. Heck, I preach in jeans. Its the Word that’s important, not how a fella tries to impress folks. 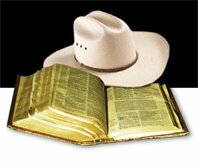 God doesn’t really worry about someone preaching in Wranglers if the Word is spoken and the one doing the preaching believes the Word and lays it on the line the way it was written! Now you take someone all spiffed up, preaching the Word that figures the nice suit is something really important in delivering the message, well, nothing wrong with a nice suit if a person can stand being in those things, but I really don’t believe it has much to do with our eternal destiny. Don’t get me wrong here, I ain’t knocking preachers in suits, just that there’s a certain class of folks that don’t really get going doing that, including me. Just a country guy I guess! More important what’s in your heart and coming out of your mouth the way I figure it. And there’s allot of country folk that really never dress up fancy for anything and to demand it for attending church is what I believe to be one of the greatest sins church folk could ever commit. Not only the sin of pride, but of turning simple folk away from the Living God because of a fairly recent tradition. I say that cause not that many years gone by allot of church folk didn’t even have a good set of clothes. Just read some of the old stories of the little country churches that were on fire for God! The came in their overalls! They didn’t even have anything else and you know what, God sure didn’t care! There’s room out here in the country for churches that just get back to the good old Gospel basics like the verses written above! Churches that don’t care about outward fake appearances. Churches that care only about Jesus! This goes along with country evangelism too. Bible studies, farm and ranch visits, what have you, just be normal! Just dress normal. Just talk normal! Just deliver that Gospel with the love of Jesus backing up every word! A perfect day in these parts! Sunny, around forty, zero wind! Things are very slowly melting, the snow is collapsing a bit. As I sit here this evening I can feel the tiredness settling into this old body. A tiredness that feels rather good really! Today was the first time in months that I was able to spend the entire afternoon wearing my Wrangler denim work jacket and not freeze to death in the process. Gone were the heavy coveralls and the heavy duty Carhart jacket and hood. I figure I was at least ten pounds lighter if not more. First robin sighted on the place today too! Yep spring is around the corner, even if that corner is four to six weeks away! And the work today was so different! yesterday I dug out a road, one of our private roads leading into the middle of a section, dug it out with the skidsteer loader, took almost three hours in order to be able to expand my world a little bit from just the corral yards to different parts of the land around here. I felt freer than I have in months being able to get out a bit. Then this afternoon I headed north a few miles and helped load some lumber slabs for our outdoor wood boiler and had em brought home to tide us over a few weeks till I can get into the woods comfortably and make some deadfall. Different, a different day and one that was badly needed for a person suffering from cabin fever, or should I say barn yard fever. Its so good to get beyond those winter set boundaries! I kinda consider being able to get out a gift. Now, I ain’t exactly what you’d call a winter type of fella. In fact about the only thing I like about it is the fact that allot of the time a guy like me can relax a bit in the evenings compared to other times of the year. I always say if it was summer here year round I wouldn’t live to long because I’d work myself to death. But gradually the long winter wears at a guy and its not all that great being locked into just a small area that the snow is plowed out of. And after being set free today, oh what a feeling! And tomorrow do it again, get out of the yards after feeding and actually do something different! Now I know this is amazingly simple but this reminds me of years ago being penned in by a life of sin. Just go through the motions, going through life day after day with not much hope of anything but the same old thing every day. Maybe that’s one of the big things in this life out in the countryside. The rebirth being brought by the change of seasons. Its a huge rebirth compared to if a person is hemmed into a city job year around. There its the same no matter what. But here, here a person sees the world changing around us. Slowly at first but there’s a change coming. Not all is really pleasant though in this process. Depending on the year there could be many, many weeks of deep cold mud to contend with. But that’s part of the process of getting winter out and late spring in. Rebirth sometimes goes through a process. Sometimes longer, sometimes short. Rebirth into the Kingdom of God doesn’t happen that way although a fella can probably use the example above as an example of a person coming to Jesus. Being drawn to Jesus over time. Going through the slow melt and then the mud before life actually takes hold. Yep, I do believe this makes sense. A little corral fence wisdom I’d say. Maybe some would say its far from wisdom and I say to each their own, works for me. Some folks, (including me), have a long,long mud season in their lives. I sure as heck did. Man, I don’t know many that had longer! But when the day come and I excepted Jesus that was it, and I never looked back to the mud and have no desire to go back to the mud! I’m just dwelling on these things tonight as I sit here tired. Rambling on. Dreaming of jobs around this place this year because there’s a rebirthed fire in me since the multi year drought seems to have been busted in these parts. More corrals to build, more of everything to build and rebuild. A renewing of this place after being hit so very hard for so many years in a row.The cattle herd is rebuilding fast and will be up to its once large size in a matter of a year or so from now. Dreams and visions are coming back, things that have been long put on hold or almost forgotten about. Living this way of life can be so violently blunt. One can be smashed down when everything seems to be going good. But its real. How could I even imagine doing this, living this way of life without Jesus as my Lord and Saviour? Life is worth it now! Those dreams a fella has are God inspired because it seems that all those dreams have something big to do with giving God the Glory! Got a big cattle herd of reputation cattle and folks notice. Give the Glory to God because of it and folks have to listen, even if they don’t seem to be. Build up a nice place and folks notice, meanwhile we give all the Glory to God to who so ever listens. Kinda hard giving the Glory to God when a person has a dump of an outfit. Deal honest and nothing can be used against a person, ever. I guess I kinda like writing when I’m tired because I never know what’ll come out. Dead honest though, I ain’t beating around the bush. I once had a mentor, a Christian mentor, giving me advice on how to live life when being in the five fold ministry. That advice was, have a tidy place, be dead honest, don’t gossip or talk behind anyone’s back, work hard, and love Jesus with everything you got! Simple words to live by and they fit.